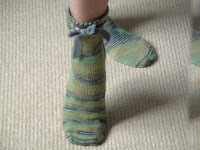 I absolutely loved knitting these socks using such a beautiful pattern and such lovely yarn. I made some modifications to the pattern by adding some stitches after the eyelet row to allow more positive ease around the instep. I also used eye of pheasant pattern for the heel flap as I think it is pretty and gives the feeling it will help an area that has most wear. I used a grafted toe ending and not the one given with the pattern. I am really looking forward to the arrival of the next delivery of sock yarn.